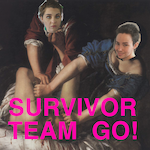 about | Survivor Team Go! Bailey Davenport is a painter, prophet, podcaster, performance artist, and visual arts grad student at UCSD! Pronouns: they/she. Bailey is committed to elevating the voices and stories of fellow survivors and to changing the culture of silence and shame surrounding survivorship. They have two cats, Eve and Pancake. Oliver Ayers is a programmer, prophet, podcaster, and barista! Pronouns: they/he. Oliver has one dog, Cheerio.